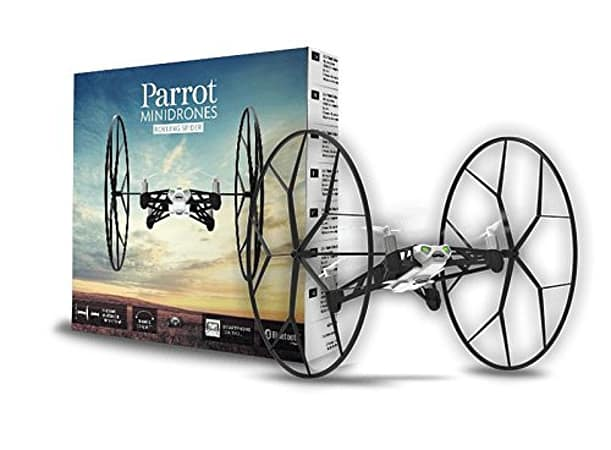 Parrot Rolling Spider Minidrone - White. Parrot Rolling Spider Minidrone is an ultra compact drone controlled by smartphone. It flies indoors and outdoors with surprising speed and stability. Acrobatic tricks are avialable from the free app for Minidrones Free Flight 3. Ultra light, Rolling Spider performs half and u turns in one swipe. Does front and rear loops in one click. With its removable wheels, it runs from floor to ceiling and walls. Equipped with a propellors cutout in case of collision. Turns 90 and 180 degrees and performs acrobatic 360 degree forward and backward flips. Free Flight 3 app offers an intuitive control from your smartphone or tablet through Bluetooth Smart and is free. Lithium Polymer battery, rechargeable and removable, lasts up to 8 minutes and full recharge in 1 hour. Take aerial shots like selfies from the sky with the embedded vertical mini camera.